Hamas derives from the Egypt's Muslim Brotherhood, the Muslim Brotherhood's Mohamed Morsi is president of Egypt. One would expect pure love to be flowing across the Gaza-Egypt border. In fact, relations are significantly worse than when Husni Mubarak was the president. What's up? It appears that Hamas wants to celebrate MB power in Egypt but becoming more aggressive toward Israel whereas Morsi et al. would has enough on its hands for the moment – starting with stabilizing its rule – without the additional challenge of engaging hostilities with Israel. That explains Morsi's willingness to shut down hostilities in November 2012 and why relations between the two sides are going from bad worse. Reuters reporters saw one tunnel being used to bring in cement and gravel suddenly fill with water on Sunday, sending workers rushing for safety. Locals said two other tunnels were likewise flooded, with Egyptians deliberately pumping in water. "The Egyptians have opened the water to drown the tunnels," said Abu Ghassan, who supervises the work of 30 men at one tunnel some 200 meters (yards) from the border fence. An Egyptian security official in the Sinai told Reuters the campaign started five days ago. "We are using water to close the tunnels by raising water from one of the wells," he said, declining to be named. Dozens of tunnels had been destroyed since last August following the killing of 16 Egyptian soldiers in a militant attack near the Gaza fence. Cairo said some of the gunmen had crossed into Egypt via the tunnels - a charge denied by Palestinians - and ordered an immediate crackdown. The move surprised and angered Gaza's rulers, the Islamist group Hamas, which had hoped for much better ties with Cairo following the election last year of Egyptian President Mohamed Mursi, an Islamist who is ideologically close to Hamas. Egyptian measures against tunnels have worsened since the election of Mursi. Our Hamas brothers thought he would open up Gaza. I guess they were wrong. Perhaps 150 or 200 tunnels have been shut since the Sinai attack. This is the Mursi era. Feb. 28, 2013 update: It's hard to believe but the Muslim Brotherhood regime in Cairo has flooded the tunnels, with court approval, despite Palestinian protests. For an overview of the situation, see "The Truth About Hamas' Smuggling Tunnels" by Paul Alster at IPT News. When Muslim Brotherhood candidate Mohamed Morsi rose to power in Egypt, Hamas hoped he would instill a new policy that would grant the terror organization more freedom on many fronts. However, recently, the organization has been punctiliously expressing that the opposite is true – instead of removing hurdles from the path of the Gaza Strip's rulers, Morsi and his people have been sending Hamas a different message entirely: Take an example from us, say senior Muslim Brotherhood officials, and even if not publicly, "implement jihad in other ways." The Egyptian movement takes pride in the image it has managed to portray, which has encouraged the international community to accept it as Egypt's legitimate leadership. Now the Muslim Brotherhood wants Hamas to follow the same path. "We paved the way, we did the dirty work for you," claimed senior Brotherhood officials in their message to senior Gaza officials. The Muslim Brotherhood's stance on Hamas is expressed in its approach to the smuggling tunnels between Egypt and the Strip. The Egyptian army has recently decided to flood the tunnels, a move that sparked resentment amongst Gazan officials, who view the tunnels as a comfortable means of smuggling goods and especially weapons from Sinai. Entrances to smuggling tunnels on the Egyptian border with southern Gaza. Mar. 14, 2013 update: An Egyptian court ruled that the Morsi government must destroy all tunnels between Egypt and Gaza. The past week saw forty tunnels destroyed. As the tunnel destruction proceeds apace, it is "causing a significant decrease in smuggling." One symptom has been that the price of raw materials for construction has skyrocketed. Surprisingly perhaps, when asked "Egypt has announced that it will close all tunnels between Egypt and the Gaza Strip. Do you support or reject the Egyptian move?" 62.4 percent residents of the West Bank and Gaza support the move and just 35.2 are against it, according to a poll by the Najah National University Center for Opinion Polls and Survey Studies taken on Mar. 1-3. Mar. 15, 2013 update: The Egyptian media is reporting that three Hamas members were involved in the attack on an Egyptian military base in Sinai, killing 16 soldiers in August 2012, the event that precipitated Morsi's dismissal of Tantawi and taking over the government. Soldiers in Suez have been issued with new uniforms after fabric used to make army uniforms was discovered in a tunnel on the Egypt-Gaza border. … An army spokesman said fabric used in Egyptian army uniforms had been found in a newly discovered tunnel on the Egypt-Gaza border. He called on people to "show vigilance in the days ahead and be aware of any incident involving the impersonation of military personnel." Hamas, which governs the Gaza Strip, called for an investigation into the smuggled fabric and said Palestinians would never jeopardise Egypt's security. The fabric was probably intended for children's uniforms or Gazan resistance groups because military fabric cannot be imported from Israel, Hamas spokesman Taher El-Nono told Egyptian satellite TV station Al-Mehwer. "However I can't give a clear answer until the investigation is complete," he added. El-Nono rejected any suggestion Hamas intended to attack the Egyptian army and said "the hand that considers doing harm to Egypt will be cut." Mar. 25, 2013 update: Egyptian media report the arrest of 25 terrorists in the Sinai, members alike of Hamas and al-Qaeda. They reportedly were carrying an anti-tank RPG launcher, ammunition, and satellite phones, as well as maps and pictures of strategic Egyptian installations. Apr. 4, 2013 update: Egyptian forces seized weapons from an underground warehouse in Sinai about five kilometers from the Israeli border; it contained 15 anti-tank landmines, grenades and projectiles. Later in the day, they raided another store of explosives, this one in central Sinai. Apr. 5, 2013 update: The Egyptian navy seized an Iranian ship carrying 62,000 weapons, including Kalashnikov rifles, sniper rifles, RPG launchers and a large amount of ammunition, most likely intended for terrorist groups in Gaza and Sinai. Apr. 14, 2013 update: Israelis have noticed the greater Egyptian willingness to keep the Sinai and Gaza under control, Barbara Opall-Rome notes for Defense News. My favorite quote in her article, from Hillel Frisch of Bar Ilan University: "Morsi has proven himself to be very gung-ho about maintaining the cease-fire. So far, Morsi, despite his Muslim Brotherhood credentials and personal convictions in support of Hamas, is putting Egypt's national interests first. He's doing more than Mubarak ever did." Ala Al-Rafati, the Hamas economy minister, said tunnel closures since June had cost Gaza around $230 million—around a tenth of the gross domestic product of the territory, whose 1.7 million residents suffer more than 30 percent unemployment. "The continued restrictions threaten to bring construction projects to a complete halt." Egypt plans to impose a 500-meter buffer zone along its border with the Gaza Strip, a senior Egyptian military official said Sunday. 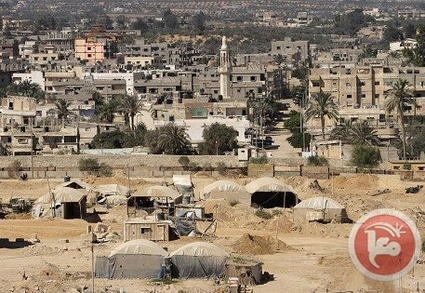 Egyptian residents living in Saladin, al-Barahmeh, Canada, Brazil, al-Sarsouriya and other neighborhoods close to the Gaza border have received eviction notices. Homeowners who received eviction orders demonstrated against the decision and burned tires in protest. Army bulldozers have also uprooted trees in the border area. The army has demolished 13 homes in the al-Sarsouriya neighborhood where tunnel entrances were found. An Egyptian military official told Ma'an that most cross-border tunnels with entrances in fields or open areas had been destroyed in a security campaign to stop smuggling. He said it was more difficult to locate tunnels that opened into houses. Egypt's army spokesman Ahmad Mohammad said that forces have destroyed 343 smuggling tunnels. He said the Egyptian military has also prohibited fishing near the border to prevent smuggling via the sea.